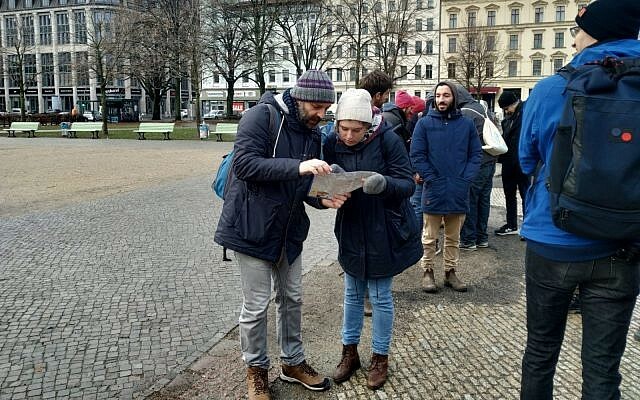 BERLIN — As a light rain fell on a frigid winter morning, a few dozen people gathered at Oranienplatz near the Berlin city center, cleaning supplies in hand. At this grassroots meet-up on International Holocaust Remembrance Day, a mix of English, Hebrew and German could be heard as newcomers gradually joined the group, making introductions and hugging old friends. 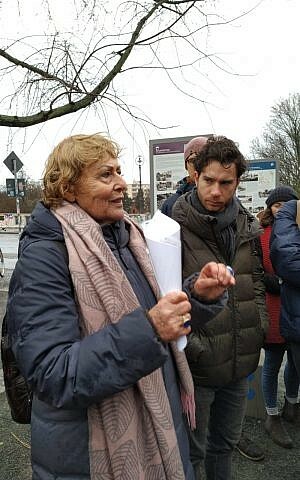 “We had the idea of why not do a cleaning in the area where we live, to commemorate, and not to make it a big event with politicians speaking, and all that – just a community thing,” said Aulinger, a German-born political educator who has worked to combat racism and anti-Semitism over the last years, including in her work as a fellow at the human rights nonprofit Humanity in Action. Launched in 1992 by German artist Gunter Demnig, the stolpersteine project currently has over 70,000 stumbling stones in more than 1,200 towns and cities throughout Europe. The small memorials are located on the street outside the last known address the victim voluntarily frequented before being relocated or killed by the Nazis. Most of the commemorated are Jews, but stolpersteine are dedicated to all victims of the Nazis, including Roma, homosexuals, and Jehova’s Witnesses. The memorials rely on individual citizens to investigate the history of the victims and apply for a plaque in their honor. The wait to have a new stolperstein (singular for stolpersteine) installed is currently up to five years. Fisher said that while the group was diverse, it appealed to some more than others – particularly to Israelis and non-Jewish Germans. “It’s also an interesting project for non-Jewish Germans. It gets people engaged, it’s a way for young Germans to reach out. If the core, the essence, is positive, good things will happen. You just need to create a platform for people to meet,” Fisher said. Ibrahim Karaman is a Turkish filmmaker who spent his childhood and much of his adulthood in Berlin. He recently returned here to promote his new series, entitled “Stateless,” about a German citizen raised in Istanbul who discovers his grandfather’s secret Nazi past. The six-part series will premiere at the Berlin Film Festival early next month. Part of Karaman’s series was filmed in the neighborhood. “Since this area was also to be cleaned and remembered today, it was especially important to me to come here,” he said. 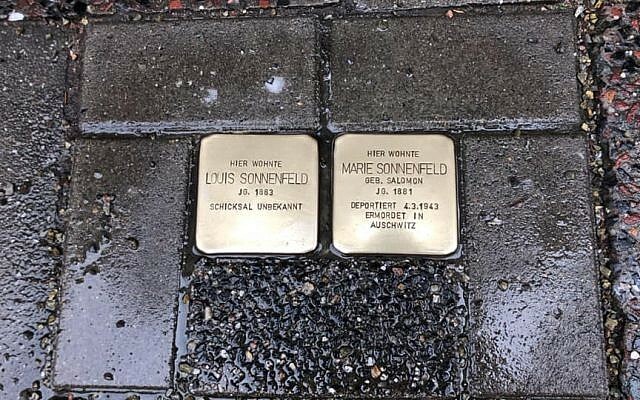 Israeli anthropologist and former Hebrew University professor Tamar Rapoport, who now lives in Berlin, has researched the stolpersteine for years. The stones are especially notable, she said, because of their biographical information on each individual. Rapoport, who addressed the group as they regathered at the conclusion of the afternoon’s work, also stressed the importance of community for the foundation and continuation of the stolpersteine memorials. As the concluding ceremony wound down, the organizers asked if anyone had a story to share. Thirty-three-year-old Stefan, who grew up in southern Germany, stepped forward to address the crowd. Stefan said that despite the huge amount of painful information the family was forced to suddenly process, there was a silver lining: His great-grandfather had two surviving brothers who fled to Haifa in 1939. This past October, Stefan and his family visited their newfound Israeli relatives, who, he noted with pride, number more than 30. “By cleaning them, you’re caring for them, you’re remembering the person, even if that will be never enough to make up for the loss of that person’s entire life story,” said Stefan.